I designed my first children’s sit-on-top 13 years ago, just before my first child was born. At the time, there was no real sit-on-top on the market designed especially for children. I designed that boat to be simple and inexpensive. Since then, a number of other manufacturers have released their own versions of kids’ sit-on-tops. As my first kids’ design was already on the market, I expected that the other manufacturers would improve on it. Instead, it appears that everyone tried to go even cheaper and simpler. The design of children’s kayaks became a race to the bottom. In the meantime, my two children have grown up to become competent paddlers. We have done many trips together, from multi-day river trips on the Orange and Vaal rivers to whitewater runs on easy rapids. While they have learned to paddle properly since they were tiny toddlers, I have learned what works for kids and what doesn’t, and what they really want and need in a boat. When I started working on the Kwando, my aim was to create a boat that would be easy for a little child who has never paddled before, to handle. 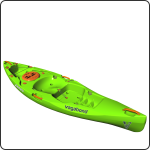 This kayak would also need to keep up with the child’s development as they grow and gain proper paddling skills. I wanted to make the boat fast enough to keep up with adults on leisurely trips, and easy enough to turn, using paddle strokes, when needed. My other design criteria included: comfort, easy to stand up on, sufficient packing space, many fittings for attaching items, a paddle holder and a bottle holder. I also wanted the boat to look cool. Do these sound like the same things that you, as an adult, want from your boat? That’s exactly the point. Children have similar needs as adults, but their requirements need to be packaged in a size that they can physically manage. True to my roots, I had to add some river-ability to the boat too. The Kwando is not a whitewater kayak, but it certainly has the pedigree to run easy rapids with ease. If you are a whitewater kayaker, you can certainly use the Kwando to teach your kids the basics of river-running. Paddle through waves, catch eddies, do ferries and learn all the basic paddle strokes; it’s all doable in the Kwando. Once your child has gained good confidence and skills, you can add some thigh straps. Straps help them to edge the boat properly in current, and to keep them in the boat when hitting waves. With thigh straps, the Kwando can be rolled pretty easily too! Take a good look at the Kwando and you will see most of the trademark features found in our sit-on-tops for adults. The Kwando offers real performance for little paddlers, in a super-easy-to-use package. My aim was not to make this the cheapest kids’ sit-on-top on the market; my aim was to make the best possible kayak that you could buy for your child. If you just want to buy a floating toy that can carry your child on water, this is not the right boat for you. If you want your child to really paddle and to love doing it, this is simply the best boat you can buy. The Kwando is not a toy; it is a real kayak for children.